Many people believe that as Christians we are to follow all of the words of Jesus. After all, Jesus is our Savior, so it only makes sense that all the words He spoke were meant for us to follow. What many don't understand, however, is that many times Jesus was speaking "Old Covenant" talk to those who were under the Old Covenant (Israel), and He wasn't actually always speaking about life in the New Covenant, which had not yet come. So the question comes up about why Jesus taught the Law/Old Covenant, even right before the New Covenant came to be. A while back my podcast co-host Mike Kapler and I did a 20-part Growing in Grace series on why Jesus taught two covenants. You can find the first part here, and then click on "Newer Post" at the bottom left to go on to each subsequent part. 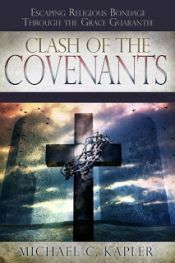 But in the meantime, here is a brief explanation on why many times Jesus wasn't teaching about life in the New Covenant, but rather life under the Old Covenant, even right before the New Covenant was about to be put into effect. From this verse (and many other verses as well), I began to see that the law's purpose was to stop mouths and to make people guilty. So the law had a very important purpose. It's just not the purpose that many people think! Many think that the law was meant to help people live right, but it actually does the opposite. The law is "the ministry of death" and "the ministry of condemnation" (2 Cor 3:7-9). Through the law, sin abounded/increased! (not decreased) (Rom 5:20). "When the commandment came, sin revived and I died" (Rom 7:9). And ultimately, what this all did was to point to the need for a Savior. We needed Someone to do for us what the law could not do. Shortly after the above verse from Romans 3:19, Paul gives us the solution: righteousness apart from the law and being justified freely by God's grace through the redemption that is in Jesus. (see Rom 3:21-26). So what the law did was it served as a tutor to bring people to Christ, so that they might be justified, not by law but by faith. Then once they've come to faith, the tutor's job is done and over with. (see Gal 3:24-25). So then, getting back to Jesus' Old Covenant ministry of preaching the law, we can see that He did it perfectly and He did it for the very reason that the law was given. He used it to stop mouths (from justifying themselves). He used it to show them how guilty they actually were (according to the law) and how the law actually condemned them and didn't help to justify them. He used it exactly as it was meant to be used: as a tutor to lead them away from justification by works, and to faith in Him. When Jesus was walking as a man on the earth, the Old Covenant was still in effect. When Jesus died, the New Covenant came into effect. The Old was then made obsolete (Heb 8:13). Jesus had been preaching the Old Covenant as the means of pointing ahead to the New Covenant. Now that we're in the New Covenant, and the Old Covenant has been made obsolete, we don't follow Jesus' Old Covenant teachings! Why follow something that is obsolete, especially when we now have something that is far superior! I'm hoping this helps anyone struggling with why Jesus taught the Old Covenant, when the New Covenant was about to come into effect.